Sirio Ristorante has returned, now set in the former Café space in Le Cirque restaurant at One Beacon Court. The menu offers straight-up Italian fare, organized by antipasti, secondi and dolci. 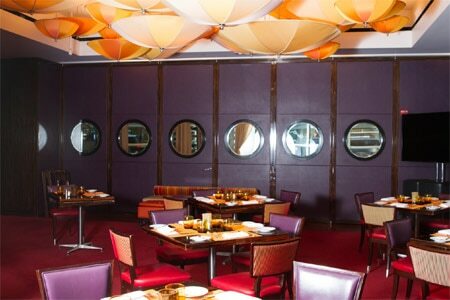 Sirio Ristorante, One Beacon Court, 151 E. 58th St., New York, NY 10022, 212-644-0202. Chef Scott Conant's latest venture is Impero Caffè, located at INNSIDE New York NoMad hotel. The menu is Italian with dishes like short rib osso buco and olive oil-poached octopus. Impero Caffè, INNSIDE New York NoMad, 132 W. 27th St., New York, NY 10001, 917-409-5171. The new L'Appart, located inside the French food market Le District, is a 28-seat restaurant meant to evoke the feel of a dinner party. Guests are even handed a glass of Champagne upon arrival. L'Appart, Brookfield Place, 225 Liberty St., New York, NY 10281, 212-981-8577. 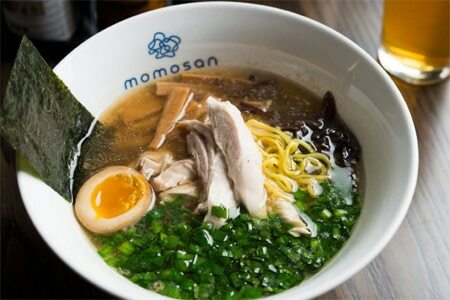 Masaharu Morimoto's first venture into the world of ramen, Momosan serves up bowls of Japanese noodle soup in Murray Hill. Not in a ramen-eating mood? The menu also has sticky ribs, soy-marinated tuna, and pork jowl with kimchi. Momosan Ramen & Sake, 342 Lexington Ave., New York, NY 10016, 646-201-5529. The chef/ringleader behind the three Empellon restaurants in lower Manhattan, Alex Stupak, has just announced he's opening a new outlet of Empellon --- reportedly the biggest one yet --- on Madison Avenue and E. 53rd Street. The new restaurant should have its burners fired up by the end of 2016. Empellon, 510 Madison Ave., New York, NY 10022, no phone. Tim Ho Wan, a Hong Kong dim sum restaurant that is known for its affordable yet high-quality fare, is opening an outpost in New York's East Village. There's no word yet on the exact location and launch date, but frugal lovers of dim sum are cleaning their chopsticks in anticipation. The Inn at Pound Ridge by Jean-Georges has introduced a $20.90 prix-fixe lunch menu available on weekdays. Options on the three-course menu change weekly, but expect dishes like spinach pizza with herbs or chicken Milanese with peas and mint. 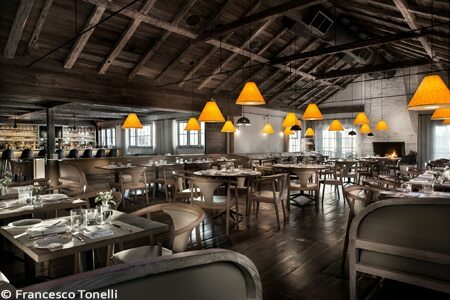 The Inn at Pound Ridge by Jean-Georges, 258 Westchester Ave., Pound Ridge, NY 10576, 914-764-1400. Mario Batali's Del Posto has just gotten that much more luxurious. Chef Batali has upped the opulent factor in the restaurant by installing new white leather chairs and waiters offering rosemary oil-scented towels to arriving diners, among other added upscale factors at the west Chelsea spot. Del Posto, 85 Tenth Ave., New York, NY 10011, 212-497-8090. Fried Chicken + Caviar = Momo-licious! Momofuku Noodle Bar has unleashed a new large-format meal. For $500, four to eight diners get two full fried chickens, two types of caviar, biscuits, truffle cream and potato chips. The feast must be ordered in advance. Momofuku Noodle Bar, 171 First Ave., New York, NY 10003, 212-777-7773. Pastry chef/wizard Dominique Ansel has teamed up with Korean chef Deuki Hong to create a Korean-accented French dip. The sandwich, debuting at Ansel's West Village spot, Dominique Ansel Kitchen, costs $22 and features tender seared beef with bacon-studded kimchi, among other ingredients. Only 300 are prepared per day so get in line early. Dominique Ansel Kitchen, 137 Seventh Ave. S., New York, NY 10014, 212-242-5111. Celebrity chef Anne Burrell, who left her post as executive chef at the West Village's now-closed Centro Vinoteca back in 2008, has revealed she is opening a new restaurant. It will be in Brooklyn's Cobble Hill and focus on American small plates. Super Alsatian chef Jean-Georges Vongerichten is launching an Italian restaurant in the yet-to-open Public Hotel (215 Chrystie St.) on the Lower East Side. The all-day venue will serve pizza, pasta and meaty dishes. Stay tuned for more information. Public Hotel, 215 Chrystie St., New York, NY 10002, no phone. One of 2015's big restaurant announcements was that chef Wylie Dufresne was coming back on the scene with a venture in the AKA Wall Street in the Financial District. Now it has been reported that the avant-garde chef and the hotel have parted ways. We'll have to wait a bit longer to get another bite of Dufresne's molecular-like fare. Since reopening in 2014, legendary New York restaurant Tavern on the Green can't seem to keep a chef. The latest shuffle has John Stevenson departing and former URBO chef Bill Peet taking over the kitchen. Tavern on the Green, Central Park W., New York, NY 10023, 212-877-8684. Almanac, the two-year-old restaurant that had originally been Mas (la grillade), will close after dinner service Saturday, April 16, 2016. The owner will focus his attention on his other West Village restaurant, Mas (farmhouse). Almanac, 28 Seventh Ave. S., New York, NY 10014, 212-255-1795. URBO, the multi-level Russian-owned New York City-themed restaurant on the corner of W. 42nd Street and Eighth Avenue, has shut down. URBO, 11 Times Square, New York, NY 10036, no phone.